"In the religion of God, there is no practice of declaring believers to be morally corrupt (tafsiq) or of declaring them not believers (takfir), nor is debasing or showing contempt for others permitted." Majmu`ih-'i Makatib, INBA Private Printing Volume 59 (Tehran: National Baha'i Archives, 1978; digitally reprinted, East Lansing, Mi. : H-Bahai, 2000), pp. 340. Tr. Juan Cole. If an off-site link fails to connect, remove the "s" in "https://" to access it. Ex-Bahais, Recovery & Support, Etc. The Universal Principles of the Reform Bahai Faith. Hardcover, Paperback, Kindle. ePub. Baha'u'llah & Abdul-Baha. 148 pages. With a new Introduction and the original 1912 Foreword. Reform Bahai Press, 2008. 148 pages. 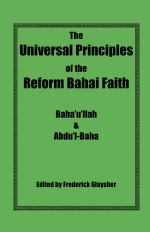 The Universal Principles of the Reform Bahai Faith collects many of the early writings of Baha'u'llah and Abdul-Baha, published in the West, seeking to restore and preserve their vision of the oneness of God, humanity, and all religions. Letters from the American Desert: Signposts of a Journey, A Vision. Twenty years in the making, in Letters from the American Desert, FG reflects on the cultural, political, and religious history of Western and non-Western civilizations, pondering the dilemmas of postmodernity, in a compelling struggle for spiritual knowledge and truth. In what is a highly autobiographical work, fully cognizant of the relativism and nihilism of modern life, he finds a deeper meaning and purpose in a universal Vision. Confronting the antinomies of the soul, grounded in the dialectic, the author charts a path beyond the postmodern desert. Alluding extensively to Martin Luther and W. B. Yeats at All Souls Chapel, “metaphors for poetry,” from Yeats’s book A Vision, FG considers the example of the global, universal message of the oneness of God, all religions, and humankind, holding out a new hope and peaceful Vision for a world in spiritual and global crisis. Far from a theocracy, FG envisions a modest separation of church and state, as the will of God, in an unorganized religion, a universal synthesis of all spiritual and wisdom traditions, in harmony and balance with universal peace, in a global age of pluralism, where religious belief is a distinctive mark of the individual, not collective, communal identity. Religion News Service By IRA RIFKIN, 1997. "Critics chafe at Baha'i conservatism." "According to the critics, the National Spiritual Assembly (NSA), which oversees the American Baha'i movement, is dominated by a tight-knit group of authoritarian officials who keep the lid on free expression by threatening dissidents with excommunication and by manipulating the process by which NSA members are elected." The Chicago Tribune, May 18, 2009. "Baha'i rift: Baha'is upset with Orthodox Baha'i Faith." "[Haifan Baha'is] contend that...the Orthodox Baha'i Faith can't call themselves Baha'i or use one of its key symbols without violating trademark law.... ...the case could set a precedent for settling religious schisms, doctrinal disputes and claims to truth." The Chicago Tribune, November 23, 2010. "Judge: Baha'i believers can call themselves Baha'i." "...the judges criticized the ruling from more than four decades ago as wrongfully trying to resolve a question of religious authority...."
The Chicago Tribune, November 25, 2010. "Federal appeals court rules in favor of splinter Baha'i group." "Adherents of the Orthodox Baha'i Faith...be­lieve the mainstream Baha'i Faith...ha­s strayed from the religion's original teachings.­" "We're the true faith. That's what we would say," [lawyer Goldberg]. "That has to be decided in the hearts and minds of the Baha'i, not by a secular court order." Ruth White, EXCERPTS The Bahai Organization the Enemy of the Bahai Religion? 1929. "Other Muslim sects in the Arab world include Sufi, Alawi, Wahabi, and Baha'i." 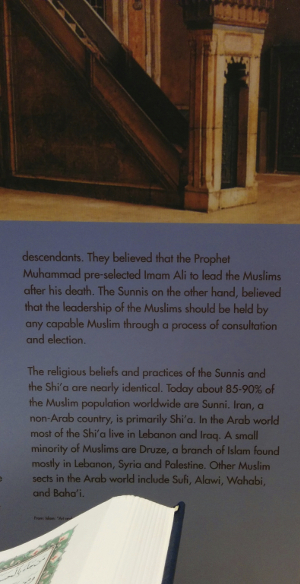 --Arab American Museum, Dearborn, Michigan. February 13, 2016. From the exhibit, "Three Monotheistic Religions." N.B. Please rely on my own books and publications as representative of my views. Since at least 1996, I have been a critic of the fanaticism of the Baha'i Faith, a Scientology-like criminal cult, based on Iranian Shiite millennialism and a fraudulent will and testament, which is attempting to create a global theocracy by deceiving and brainwashing its unsuspecting members into a false version of its history and then using them to carry out Baha'i jihads against dissenters and critics. I've been stalked, harassed, and misrepresented, on and offline, by fanatical Haifan Baha'is and Iranian Shiite and other Muslims for over a decade and a half, some of the latter frequently anti-semites, as well as possibly other religious fanatics, posting to the Internet false information and mashups intended to libel and discredit me. By attempting to destroy all other Baha'i denominations through various methods characteristic of the worst in Islam, Haifan Baha'is think they can maintain their claim since 1921 that they alone constitute the Baha'i Faith. As Professor Juan Cole writes in his book Modernity and the Millennium, Columbia University Press (1998), the Baha'i administration has increasingly come under the control of fundamentalists, "stressing scriptural literalism... theocracy, censorship, intellectual intolerance, and denying key democratic values" (196). A Response to Moojan Momen's Takfir & Slanderous Vilification FG. Religion 38 No 4 2008. Including many suppressed and misrepresented books. As one of the people extensively harassed both on and offline, since as early as 1996, by fanatical Wilmette-Haifan Baha'is and Muslims, including being tracked, slandered, and misrepresented across the Internet, I bring a unique experience and perspective to all things Bahai. Since 1976 I've been a member of the Reform Bahai Faith, a universal, unorganized form of religion that respects the essential truths of all of the great religions and wisdom traditions. I have published in the Bahai journal World Order, and served in several Bahai communities throughout the United States. Having read extensively in the Bahai writings for over forty years and having had university coursework in Biblical and Islamic religious studies and theology, I can address issues of cultural, historical, and spiritual importance to members of the unorganized Reform Bahai Faith and other interested people of various religious and secular outlook. I no longer address questions directly related to the several other Baha'i denominations. I will not dignify antisemitism with a response. I'm especially able to discuss the role of Iranian Shiite "takfir" in Baha'i circles, the identification and denunciation of "infidels" and "apostates," having witnessed its fanatical, pernicious use against countless victims on and offline, in the USA and elsewhere. As a member of the Reform Bahai Faith, I have been intimately involved in the issues of free speech and conscience within the Bahai Faith since 1996, if not longer. Most American Baha'is are naively uninformed about these issues, if not deceived and brainwashed into a cult-like and mindless acceptance of a distorted version of its history, "taqlid," which Baha'u'llah had explicitly "Removed from the Book." I am also the editor or author of two books on the Bahai teachings. The Universal Principles of the Reform Bahai Faith. Baha'u'llah & Abdu'l-Baha. With a new Introduction and the original 1912 Foreword. Hardcover: ISBN: 9780967042138 148 pages. Reform Bahai Press, 2008. Letters from the American Desert: Signposts of a Journey, A Vision. ISBN: 9780967042114. Preface. 172 pages. 2008. Glaysher finds a deeper meaning and purpose for the individual and the world community in the writings and global vision of Baha’u’llah, as expressed in the Reform Bahai Faith. Glaysher invites readers to consider the implications of the universal, moderate form of the Bahai Teachings as interpreted by Abdu’l-Baha, Baha’u’llah’s son, who had spoken throughout the West in Europe, England, and the United States from 1911 to 1913. Abdu’l-Baha’s message of the oneness of God, all religions, and humankind holds out a new hope and vision for a world in spiritual and global crisis. Far from a theocracy, the Reform Bahai Faith envisions a separation of church and state as the will of God, in harmony and balance with universal peace, in a global age of permanent pluralism, in a world of multiplicity, where religion is a reflection of individual distinctiveness, not of communal identity. MA, University of Michigan, English, 1981 BGS, University of Michigan, English, Biblical Studies, Islam, 1980 Illinois State University, All But Dissertation, English, Rhetoric. 1983- 1986. Ten years teaching, at the university and college level, English, Rhetoric, American literature, non-Western literature, World Religions, and other courses. A Fulbright-Hays scholar to China in 1994, I studied at Beijing University, the Buddhist Mogao Caves on the old Silk Road, and elsewhere in China, including Hong Kong and the Academia Sinica in Taiwan. While a National Endowment for the Humanities scholar in 1995 on India, I further explored the conflicts between the traditional regional civilizations of Islamic and Hindu cultures and modernity. I have been an outspoken advocate of the United Nations, an accredited participant at the UN Millennium Forum (2000), and attended the UNA Members Day 2012 on the Millennium Development Goals, held in the General Assembly Hall. "The right to search for truth implies also a duty: one must not conceal any part of what one has recognized to be true." —Albert Einstein"
"Unmeasured vituperation employed on the side of the prevailing opinion really does deter people from professing contrary opinions and from listening to those who profess them." —John Stuart Mill, On Liberty (51-52). "In the past Americans have always been dissenters. Americans have never submitted for long to injustice." —Robert Hayden, interview in World Order, reprinted in Collected Prose, edited by FG. University of Michigan Press, 1984 (85). "Men never do evil so completely and cheerfully as when they do it from religious conviction." —Pascal, Penses #894.
than the protection of human liberty?" "The conscience of man is sacred and to be respected." "Refuse to set up once again a sect similar to that of the Shi'ihs." "Mr. Glaysher, in my view, is taking some positive steps to resolve some serious issues in the Baha'i community. Because there are seven million Haifa/Wilmette Baha'is does not make them right or genuine Baha'is. It simply means that they are a large organization. And I emphasize the word "organization." While it is the main source of teaching, it is also an organization that has hurt a lot of people with authoritarian actions, and it has put a damper on honest scholarship unless it agrees with its policies. It is the only religion I know that has a "protection committee" and that spies on alleged dissidents. What are you Baha'is (I assume you are Baha'i) afraid of? What do you need protection from? The Faith widely claims "oneness and unity." There is none. There have been conflicts since the Faith began. This is shameful for a Faith that boasts unity. Fact is, it is a "party line" religion where to be a good Baha'i is to go along and keep your mouth shut. I have loved the Faith, but with its conflicts, I've been tempted to chuck the whole thing. But I've not been able to do that because in spite of them, there is a glitter of truth in it. And believe me, that "truth" is not the organization, but it is in the Faith self. You can't organize or legislate a faith, and, certainly, Haifa/Wilmette does not own it (even though they think they do). The Faith needs a total overhaul. It has forgotten what the real Faith is." --Joel Bjorling, comment #4 (Dec 14, 2014) on The Universal Principles of the Reform Bahai Faith, A new view of the baha'i faith. Ruth White, EXCERPTS Is The Bahai Organization the Enemy of the Bahai Religion? 1929. Discusses the unauthentic will of Abdul-Baha. The foremost forensic expert of the British Museum, Dr. C. Ainsworth Mitchell, judged it a fraud in 1929. For further details, see Ruth White's Bahai Leads Out of the Labyrinth. New York : Universal Publishing, 1944. Julie Chanler, EXCERPTS From Gaslight to Dawn: An Autobiography. The New History Foundation, 1956. Court Opinion as a PDF from this website. Opinion, Judge Sykes, p 14-15: "Considered in light of these First Amendment limitations on the court’s authority, certain aspects of the 1966 injunction are troubling. The decree declares that “there is only one Baha’i Faith,” that Shoghi Effendi was its last Guardian and none has come since, and the National Spiritual Assembly was its representative and “highest authority” in the United States and was “entitled to exclusive use of the marks and symbols of the Faith,” including the exclusive use of the word “Bahá’í.” Declarations of this sort push the boundaries of the court’s authority under Kedroff and Presbyterian Church. 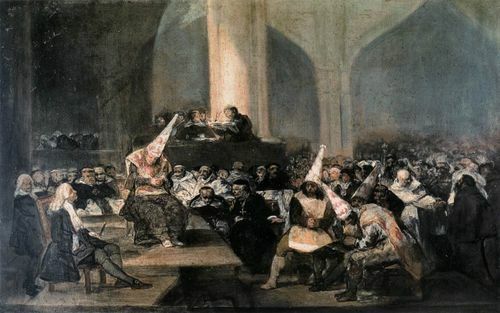 In church property disputes (trademark suits obviously qualify), the First Amendment limits the sphere in which civil courts may operate. When a district judge takes sides in a religious schism, purports to decide matters of spiritual succession, and excludes dissenters from using the name, symbols, and marks of the faith (as distinct from the name and marks of a church), the First Amendment line appears to have been crossed" (boldface added). Comments posted to Chicago Tribune Forum. Judge Diane S. Sykes: "Clearly raises some Constitutional concerns"
October 18, 2004, by the Israeli Belfilms. 2.4 hours. Given the US Federal Court decisions ruling three times against the Haifan Baha'i denomination in 2008 to 2010, I believe it is the right moment to make available this full interview for people researching the Bahai Faith. Transcript of key passages regarding the "Fraud Shop,"demonstrating the concern of Israelis about who is truly in control of the Baha'i Faith in Israel and where the vast sums of money are coming from for the massive construction projects on Mt Carmel, Haifa, Israel, which is to say, Shiia and/or perhaps Sunni fanatics whose antisemiticism is reflected in the ban on teaching the Baha'i Faith in Israel; Baha'u'llah's universal teachings coopted into a multi-generational form of Islamic dawah or call to become Muslim that Westerners especially fail to perceive and understand; ultimately furthering the goal of subjugation of non-Mulisms, around the world, into dhimmitude--which most emphatically was not Abdul-Baha's open and universal interpretation of Baha'u'llah's teachings for the modern world, highly analogous to the open, universal respect for all religions and viewpoints that has evolved in pluralistic democracies around the world, Abdul-Baha's "spiritual democracy." Alison Marshall - "How the Baha'i administration behaves"
Biography of Juan Cole on his blog (search keyword "Baha'i" ), for his criticism of "the secretive and duplicitous leadership," among other things. In "The Evolution of Charismatic Authority in the Baha'i Faith (1863-1921)," in Robert Gleave, ed., Religion and Society in Qajar Iran (London: RoutledgeCurzon, 2005), pp. 311-345. [Important article not available online. ], Cole writes, "This tying of wealth to charisma was to be crucial for the fortunes of the religion" (314). "Baha'ullah was committed to a separation of religion and state, and renounced any theocratic claims on the civil government by himself or his religion, saying, he only desired the hearts of men" (317). Speaking of Abdul-Baha, Cole states, "...His first major work to be published after Baha'u'llah's death, his Treatise on Leadership. There he explained that leadership is of two sorts, worldly and spiritual. Spiritual leaders 'have no relationship to corporeal concerns, affairs of political leadership, worldly matters'. He added, 'These latter souls have nothing to do with affairs of civil leadership, nor do they seek to interfere in them. Thus, in this most great cycle of the maturity and adulthood of the world, this matter has been put into the text of the divine Book as one might put lead into the structure of a building.' He was emphatic that the 'funcition of the religious leaders' is only to attend to spiritual matters, and that whenever such leaders have 'intervened in the world of political leadership it was has resulted in disaster" (323). Later Cole quotes Abdul-Baha teaching, "'In the religion of God, he asserted, 'there is no practice of declaring believers to be morally corrupt (tafsiq) or of declaring them not believers (takfir), nor is debasing or showing contempt for others permitted' (331, cf. 332-333 for more details on "shunning" )." "Baha'u'llah believed that true discourse (bayan) would always win out, and although he counselled against close association with the ungodly, he never developed a system of shunning" (333). "Once established, shunning became a tool for later leaders with implications far beyond the Muhammad Ali schism, and was used to control and manipulate adherents with regard to issues of personal conscience and even sometimes choice of place of residence! A suspicion of non-conformity, a demand for blind obedience [taqlid], and a concern with being constantly 'firm in the covenant' came to characterize important elements of the community over time" (333). "Still, Abdul-Baha continued to respect individual conscience and individual contributions that acknowledged his authority, and in his talks in the US he often spoke with fervent admiration of rights, liberty and parliamentarly democracy" (339). "The dispute over the succesion to Baha'ullah demonstrated the instability of the system of authority he created" (340). It can not be overemphasized that the role of the "Baha'i merchant clans" is insightfully discussed. "Reply of Juan Cole to Peter Khan Talk in New Zealand of June, 2000"
>>>Ratcheting further and further toward being similar to Scientology 1999. >>>Juan Cole On Baha'i Takfir Declaring people infidels, apostates, non-believers. Cole mentions on his blog that he was "forced out of the community in 1996 by fundamentalist elements in the leadership, who try to impose censorship and conformity on vocal intellectuals.... The more fundamentalist side of the religion is usually hidden from outsiders and new believers, and is probably more pronounced in the US than in the UK anyway." Scientologists believe that Scientology is vital to themselves, mankind and the universe and its success, here on earth, right now, is more important than ANYTHING." "...Scientology's extreme policys on its importance makes it vilify its critics to the point that it figuratively blinds its members. ANY complaints, no matter how legitimate, are seen as "attacks" in the eyes of its members." "These are effectual and sufficient proofs that the conscience of man is sacred and to be respected; and that liberty thereof produces widening of ideas, amendment of morals, improvement of conduct, disclosure of the secrets of creation, and manifestation of the hidden verities of the contingent world. Moreover, if interrogation of conscience, which is one of the private possessions of the heart and the soul, take place in this world, what further recompense remains for man in the court of divine justice at the day of general resurrection? Convictions and ideas are within the scope of the comprehension of the King of kings, not of kings; and soul and conscience are between the fingers of control of the Lord of hearts, not of [His] servants. So in the world of existence two persons unanimous in all grades [of thought] and all beliefs cannot be found." —Abdul-Baha, A Traveler's Narrative, 91. "This is a goodly temple and congregation, for--praise be to God!--this is a house of worship [Central Congregational Church in Brooklyn on 16 June 1912] wherein conscientious opinion has free sway. Every religion and every religious aspiration may be freely voiced and expressed here. Just as in the world of politics there is need for free thought, likewise in the world of religion there should be the right of unrestricted individual belief. Consider what a vast difference exists between modern democracy and the old forms of despotism. Under an autocratic government the opinions of men are not free, and development is stifled, whereas in a democracy, because thought and speech are not restricted, the greatest progress is witnessed. It is likewise true in the world of religion. When freedom of conscience, liberty of thought and right of speech prevail--that is to say, when every man according to his own idealization may give expression to his beliefs--development and growth are inevitable. Therefore, this is a blessed church because its pulpit is open to every religion, the ideals of which may be set forth with openness and freedom." —Abdul-Baha, The Promulgation of Universal Peace, 197. Abbas_Amanat, Resurrection and Renewal, 1989. Denis MacEoin, Crisis in Babi and Baha'i Studies Bulletin, (British Society for Middle Eastern Studies), Vol. 17, No. 1 (1990), pp. 55-61. Denis MacEoin, A Few Words in Response to Cole's 'Reply to MacEoin.' British Journal of Middle Eastern Studies, Vol. 18, No. 1 (1991), pp. 86-87. The Modern Inquisition: Seven Prominent Catholics and their Struggles with the Vatican. 2000. Australian former priest Paul Collins. Challenging apostasy: Responses to Moojan Momen's ‘Marginality and Apostasy in the Baha’i Community’ Original Online FG, et al. William Garlington. The Bahai Faith in America. Praeger. 2005. Review. Sen McGlinn, Church and State. Leiden, 2005. Review. Disclaimer: Given Abdul-Baha's respect for the individual's conscience and the frequent lack of it in everyday Bahai life, I must emphasize all ideas and opinions belong to their authors and do not necessarily reflect my views. And given the difficulty of authenticating identity on the Internet, I caution the reader that it is possible that people of ill-will of various opinion, whether Sunni or Shia Muslims and others, opposed to the Bahai teachings, however interpreted, might misrepresent themselves. It is left up to the individual here to make such judgements for him or herself. Looking for something? Use the Google custom search engine below for this website. Site Map 600+ pages. OrdinarySiteMap 150+ megabytes. Bookmark this site! Created and maintained since May 8, 1998 by FG. Dedicated to the restoration of Abdul-Baha's respect for free speech and conscience.